(a UNESCO World Heritage Site since July 2004) and the Valle dell’Ombrone where rivers of the same name run through the valleys. 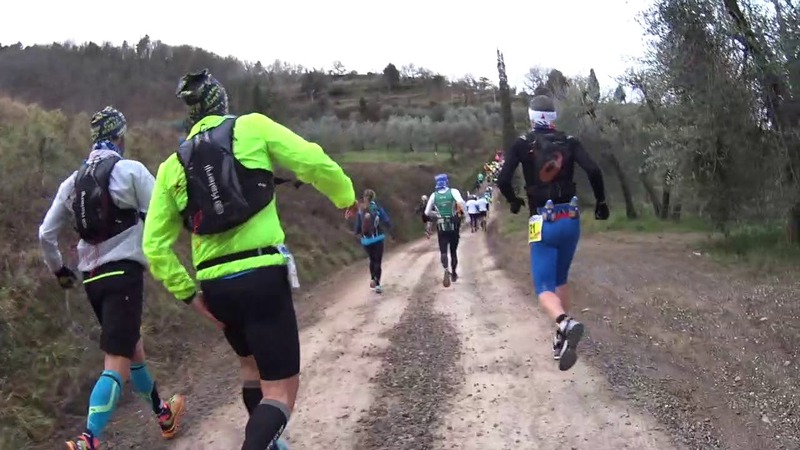 Montalcino provides the perfect location for trail running; big climbs and descents as well as steep trails from its highest point at 680 m.a.s.l. to its lowest at 120 m.a.s.l. through the woods, which cover about 50% of the territory, vineyards, and the famous Sienese hills, marked by numerous paths, mule tracks, cartroads, and historical pilgrim and trade routes like the Francigena and the Maremmana. Even the time of year that was chosen is no coincidence. Forging the connection to the Consorzio del Brunello di Montalcino, the event will take place on the weekend prior to Benvenuto Brunello (the presentation of the latest vintage of Brunello di Montalcino released on the market that year), the second Sunday in February, guaranteeing the right weather conditions for authentic trail races! 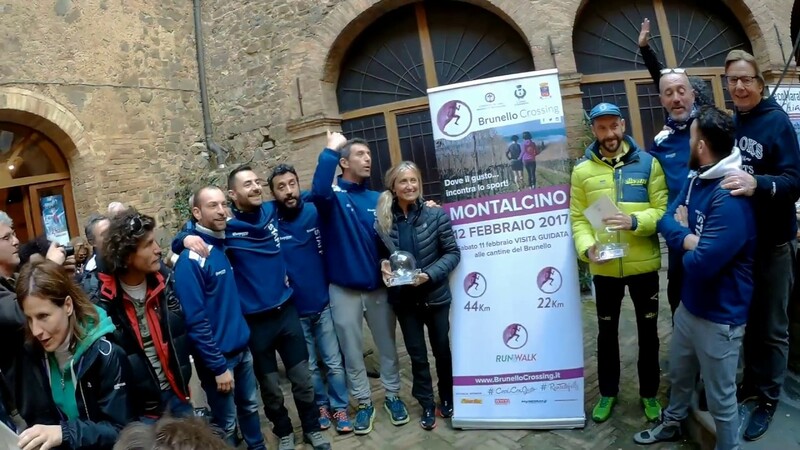 BRUNELLO CROSSING is an event that was started by a group of sports enthusiasts and lovers of the Montalcino territory who got together and developed an idea that goes beyond the 44km, 23km, and 13km competitive races. There will also be a 13km non-competitive race and guided tour of wineries with a chance to try local specialties. Also lined up is the Runners’ Lunch on both Saturday and Sunday as well as several fluid stations along both competitive and non-competitive routes celebrating the close link between sport, territory, and wine… everything of the finest quality, of course! The 2017 and 2018 editions both sold out two weeks before the race giving us the proof that we were on the right path by getting positive feedback from both participants and the press. We strive not to neglect the high technical/competitive profile of all the courses and participating athletes as well as the quality of services connected to the event, which created a pleasant and collaborative atmosphere. Many institutions, both public and private, have contributed to great success of the previous editions. The City Administration that has backed us and helped right from the start, the Consorzio di Brunello di Montalcino that has acted as a bridge between registered runners and Brunello Crossing, the Municipal Police, the Carabinieri police force, the Misericordia and Civil Protection Unit that have guaranteed that the event take place in complete safety. The high profile of the main sponsors which, with their support, not only made this event possible, but also ensured the quality and protocol of Brunello Crossing. The only thing left to do at this point is invite you to participate in one of our competitive races or in the non-competitive walk on February 10th, 2019 as well as in the guided tours of the Brunello di Montalcino wineries on February 9th. Ricevi le Foto della Brunello Crossing 2019 su Smartphone con Studio5 tramite Pica! Premio video Brunello Crossing "Il Giglio"
A magical territory, which varies in its many forms: the different sides of the Montalcino hill slowly roll into the enchanting Val d’Orcia, to the bottom of Monte Amiata and to the plains leading to the sea on the other side. Harmonious rolling hills with soft elevations that alternate between olive groves, vineyards and fields of wheat. Small plots of land topped with isolated farmhouses, majestic castles, little country churches surrounded by their hamlets: this is the land of Brunello Crossing, dominated by the medieval town of Montalcino. If you run with us, you will enjoy all this in addition to the best that this territory produces, which make it an absolutely outstanding place the world over. Exclusively for Brunello Crossing participants and their family members and friends, the chance to live moments that only Montalcino can offer: a truly unique sensorial experience, a type of tourism that is timeless and that gives the best it has to offer in every season. Wine is without a doubt one of the top products from Montalcino as it is known, valued and exported all over the world. On a winery tour, you can be immersed in the authentic traditions of this land, meet wine producers, experience the aromas of the wine that change over the four seasons and, finally, get a taste of history in a glass right inside the places that best interpret the Italian winemaking tradition. Tours include a brief description of the winemaking process – agricultural and enological – that lead up to the final product, a tour of the vinification and ageing cellars and a wine tasting featuring the vintages chosen by the wineries often accompanied by other typical local products. It is a wonderful opportunity for you to discover the enchanting world of wine and to meet the winemakers in person. Discovering a territory also means exploring it in all of its flavours: bring out the wines, olive oil, salami, sweets, the typical products of Montalcino! In a digital world where everything runs at high speed, time can sometimes go by very quickly so it is a pleasure to discover this little corner of paradise that has remained almost untouched for centuries, a place where you can relax and taste traditional delicacies. After a guided winery tour, you can sit at table for a light lunch paired with the legendary Rosso and Brunello di Montalcino wines. Lose yourself in the thousand shades of Montalcino, take a bite out of history which, through its many flavours, takes you back in time, giving you an experience that you will always remember. Learn about and taste the red gold of Montalcino and the Val d’Orcia. A precious spice, an explosion of taste on the palate with zero calories, a source of antioxidants with antidepressant and even aphrodisiacal properties: saffron is the star of this experience! A visit to a packaging laboratory to learn more about this product from cultivation (characteristics and productive potential) to its use in cooking followed by a saffron tasting! *Saffron tasting includes honey paired with pecorino cheese and local cold meats, cantucci biscuits and saffron beer. Making “pasta” here with us is like casting a little spell! Discover the secrets of homemade pasta, the pride of the Montalcino tradition and learn from the wise experienced hands of local women who have decided to help out. Eggs and flour, a pinch of salt and… the magic of the “farmer’s wife” will show you the rest. Together we will preserve this precious legacy that our grandmothers have taught us: traditions that will not fade away in Montalcino! Shuttle supplement: (for those who do not have their own vehicle and prefer booking a spot in the minivans) 8 euros per person. Each winery has its own menu. In some places it is a cold lunch (canapés, cold meats, cheeses, salad) while in others there is a starter and a first dish or a hot second dish. All tours and activities will take place on Saturday, February 9, 2019. Participants will be divided into groups of 10-20 people according to the winery that they have chosen. All those who sign up for tours and activities are entitled to a free visit of the ramparts of the Fortress of Montalcino, scheduled for 17:00 on Saturday, February 9, 2019. The tour of the ramparts of the Fortress is made possible by the collaboration of the Pro Loco di Montalcino. You will be immediately contacted by the organizers who will then provide you with all the payment information and will confirm your registration.